The Game Changer picks up where The Perfect Game left off. The story literally begins the day after Jack shows up on Cassie's doorstep﻿ begging her forgiveness and professing his love. I'm not going to lie because I was really hesitant to read this book. I enjoyed the Perfect Game but I just didn't love it and I wasn't sure if I wanted to spend money on something I was going to have mixed feelings about. I think maybe what bothered me the most in the first book is that it seemed like all the sudden one day Jack finally got it together, realized he needed Cassie and goes to win her back. I am not sure after the first book I felt he deserved her forgiveness so quickly nor was I sure he could be faithful and fight for their relationship after he threw it away so quickly the first time. I was left at the end of The Perfect Game really needing more to the story. Right away in The Game Changer J. Sterling has Jack tell us what he was doing those 6 months away from Cassie and now I can honestly say his actions, everything he did, any thought he had was nothing short of romantic and honorable and by the end of his confession I felt he deserved that second chance. I finally understand why it took him so long. I now believe he learned his lesson and will never make that kind of mistake again and throughout this entire book he proves his love and devotion to Cassie. After Jack pours out his heart to Cassie you watch as the two of them navigate the ups and downs of a relationship in the public eye. So there is definitely drama in this book but its so much different than what we read about in The Perfect Game. One of the things I loved most was being able to watch Jack and Cassie learn to trust each other and work together fighting for their relationship. Now that you know Jack's grown as a person and has no doubt he is right where he wants to be with Cassie regardless of whether or not that life includes baseball, in his mind, his life will forever include Cassie. 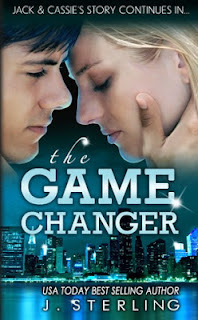 The Game Changer is Cassie's story of growing up and realizing that Jack is the one she wants no matter how hard thats going to be. You really see her work through her questions and doubts of whether or not she is strong enough to handle all that comes with being Jack's girlfriend. J. Sterling has done and absolutely beautiful job finishing Jack and Cassie's story and as the last page was turned I couldn't have been more happy for those two characters. I can now officially say I am a huge fan of Jack f'n Carter! This is a beautiful story about finding true love and fighting as a team to withstand the pressures that are thrown at you in life. Jack and Cassie's story teaches us it may not be easy but when you find the person you're meant to be with all the ups and downs are worth it. Don't hesitate to read this book, you're going to love it!